Every spring, the guys prune the orchard. And every spring, I look out on the branches scattered everywhere and think to myself: "Self, you should really search Martha's website for directions on forcing branches to bloom." But I have never actually bothered to do that. Right now it seems impossible that this grey, depressing landscape will soon turn into this. I did see buds today, though. Perhaps there is hope. So I collected some branches and located a Martha tutorial on forcing branches to bloom. Now? We wait. Howardena Pindell. (1973). Pen and ink on punched papers, talcum powder, and thread on oak tag paper, 10 1/8 x 8 3/8" (25.9 x 21.3 cm). Gift to NYC's MOMA by Lily Auchincloss. This piece, put together with hundreds of tiny pieces of punched paper, made me think of the art of my friend, Debra Tomson. Debra can make beauty out of the tiniest things. Mattresses, originally uploaded by houze. San Francisco sculptor Dustin Fosnot collected discarded mattresses for his recent solo show, Cyanide. 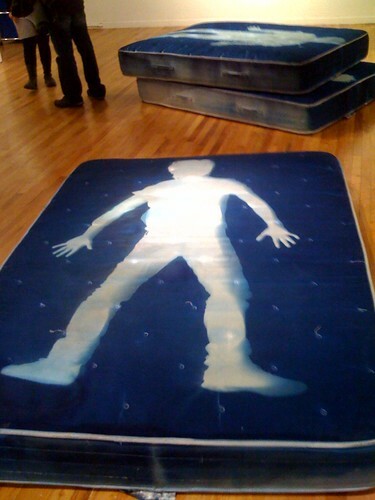 To make the image appear on the fabric, Fosnot soaked the mattress in a light sensitive cyanotype solution. He then exposed them to sunlight while lying on top. Fosnot invites the viewer to imagine his or her own associations. What does this piece make you think of? Hearts police box, originally uploaded by Jamie.184.. I woke up this morning to find half an inch of wet snow sinking into the mud in our yard. Bleech! I am so ready for good weather! How about you? Spring in Montana is more depressing to me than winter. All that melting snow makes everything brown and muddy. Mud is everywhere - in my kitchen, in my car, on my pants, all over my dog. I'm ready for sunshine. 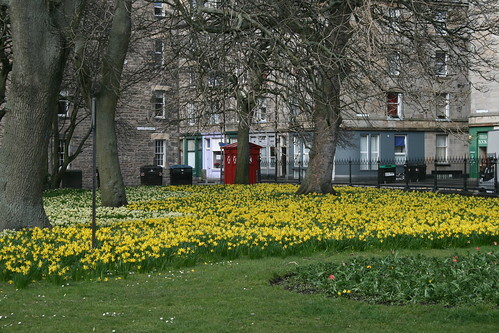 I used to live in Edinburgh, Scotland and though Edinburgh had its share of depressing weather, they knew how to "do" Spring. Some [uncharacteristically] brilliant committee, at some unknown time, decided to plant daffodil bulbs under the grass in every public green space. Come Spring, carpets of daffodils greet you on your way to work. Not a bad way to start the day. I've been working on this painting the last few weeks. It was inspired by a painting on the cover of Country Home's final issue. I couldn't find an artist credit anywhere in the magazine, so I decided to see if I could copy it. It's not something I usually do, but my friend (and enabler) D. convinced me that I "could learn alot" by copying. And of course, its true that art students everywhere copy the masters with exactly that goal in mind. It was a good project for me. I've been feeling really bored lately. And disturbed by that since I've always felt boredom is for people with no imagination whatsoever. And that can't be me. I threw it out in the twitter universe and got this back from long-time friend @opossom: "Boredom, like rage, is a form of fear. And fear is the absence of love. Love your work? Simple answers at simple times. Luck." And @Opossom isn't wrong. My work projects are plentiful and all-consuming. A good thing. But by the end of the day my creativity is sapped. In spite of myself, I did learn from copying this painting. I saw how the artist picked up leftover paint from the palette and blended it with the skin and t-shirt of the subject. Greens, oranges, reds, blues across bubble-gum pink and white. Cobalt blue streaks in the hair to give it texture. The lips are "mine" and I was pleased when my husband told me, without any prompting, that the lips were his favorite part. I photographed the painting's evolution and put the photos in an album on Facebook. Are we friends on Facebook? If not, friend me. And if you can tell me who the original artist from Country Living might be.. When I'm in New York City, I love to drop into a shop called The Blue Tree. Not much of website --too bad for you--but the store is a garden of discovery. Blue Tree is owned by the actress, Phoebe Cates (Gremlins, Drop Dead Fred) and I have actually seen her in there unpacking boxes. No joke. She lives in the neighborhood and leaves all the acting to Kevin. Anyway, the POINT of this story is that more three years ago, I saw this purse at Blue Tree and I'm still thinking about it . The Birds and the Bees from Femme Sud's Ex Libris collection. I didn't want to spend the money. Should have. Baaaa-Studs - A You Tube Worth Sharing. This coffin, in the shape of a cocoa pod, is on display at San Francisco's de Young museum. The pod is the work of Kane Kwei, a Ghanian from the village of Teshi, just outside the capital of Accra. In Ghana, funerals are both important ritual and decadent affair. Children of the deceased are assigned new parents, and mourners spend days in heartfelt conversation with their lost loved ones. Women give the body a ritual bath and set out objects the person will need in the afterlife - a spoon for tea, a clean t-shirt, and perhaps a comb. Money, wrapped in a cloth, is waved over the face of the deceased so they will know how much friends and family have donated toward the cost of the funeral. Until his death in 1991, Kane Kwei was the go-to guy for fantasy coffins in Teshi. They were true works of art - built like furniture, and upholstered in tie-dye or velvet. A coffin like this one symbolizes the earthly success of the deceased. Ghana was, at that time, the world's largest producer of cocoa. A coffin like this would have suited a cocoa merchant or trade worker. Also intriguing is the spring onion coffin. What about you, what would your fantasy coffin look like? I've been looking at paintings all weekend. I am very taken with the idea of this piece, Star Quilt, by Jeanie Tomanek. I found her work via In the Labyrinth. This painting, Anniversary, also really says something to me. Yesterday's fresh snow helped me track the footprints of a tiny field mouse who has made a nest under the column outside my window. I like how he "shovels" the front walk. These gloves were made for Gimbel's Department Store in the 1940's. They are for sale at Vintage Textiles for $225. 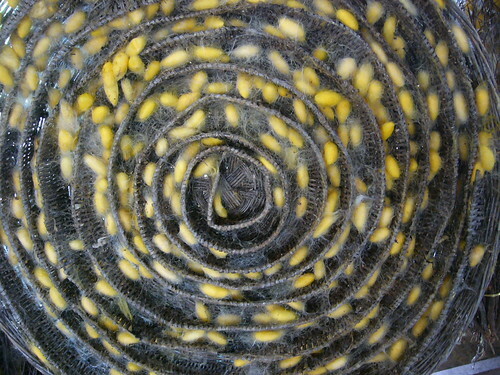 Spiral of cocoons, originally uploaded by abby.t. Silkworm cultivators use these spiral cane baskets to "grow" cocoons. When the cocoons are ready, they will be harvested and boiled, to remove the thread for textile manufacture. Big windows and big sunshine brings troubled birds to my door. This little guy crashed into my window a few minutes ago. He stayed long enough for me to get a good photo of his crown, and then [thankfully] recovered. I believe he is a ruby crowned kinglet. They are quite small - maybe about the size of your thumb. Danish artist Camilla Prasch makes jewelry out of everyday objects. Here, a shawl made of price tags. I actually liked it better when I thought it was cut-out text. I liked the idea of someone's words (or your words) hanging heavy around the neck by invisible thread. Rubber glove necklace is supposed to respond to the movement of the body. It is interesting to think of how a dozen hands would caress the wearer as she walked. Are the hands good? or evil? The gloves are sewn together with thread. Two Kitties' Two Year Blog-a-versary. 1) Cynthia Treen's felted rocks. I just bought some wool roving this week and may give this a shot on Saturday. 2) I was remembering some of my favorite poems. Two years ago at about this time, I started Two Kitties. 1) "What's On My Mind" was my very first post. 2) "Winter Wheat" is still a favorite. 3) And after two years, and hundreds of dollars spent on fabulous buttons, I still haven't made these rings. But I will. Thanks for reading me and leaving comments. I have loved getting to know all of you! I know my posts can be rather random - some say that is what the enjoy the most. I hope you keep on keeping on with Two Kitties. "In harmony with the natural laws of growth, they provide an incremental, sequential, highly integrated approach to the development of personal and interpersonal effectiveness. They move us progressively on a Maturity Continuum from dependence to independence to interdependence....they become the basis of a person's character, creating an empowering center of correct maps from which an individual can effectively solve problems, maximize opportunities, and continually learn and integrate other principles in an upward spiral of growth." This is the kind of management program that would drive me to use crystal meth. and this is what it is like or what it is like in words . Think about last week. Would it/Could it have gone any more smoothly if someone (or you) had just been straightforward (but polite) about something that was on your mind? I'm loving these re-purposed vintage suitcase pet beds from etsy.com seller Vintage Renaissance! When you think of people who work in theatre, you probably imagine a lot of people in dark room, speaking with German accents, and wearing black. Sometimes that does actually happen. This is not a Sicilian wedding. It is an actual meeting to see the set models for the new show at The PlayGround Theatre. I'm the second one from the left and I'll never give up black. NEVER! But seriously. We're all beavering away getting everything ready for the opening of Inanna and the Huluppu Tree. My job is to help write the study guide that accompanies the play and design some "hands on" activities for the kids to do in the classroom. The play is based in Sumer and it is from this area that the oldest written records are found. Sumerians loved to write. They recorded everything on clay tablets that were small enough to carry around. Some beautiful examples can be seen at The British Museum in the Mesopotamian Room. One of the projects I thought of was to ask the kids to make tablets out of self-hardening clay to write on with a toothpick. So tonight? I kicked it like a Sumerian. I cracked open a beer (Sumerians loved beer) and mixed up a batch of self-hardening dough "clay." I wanted to make sure the recipe was a good one and that the project would be fun - not frustrating - to kids. As always, White Kitty seems to know the difference between ordinary work and an interesting project. He came to supervise. He's not, technically, allowed in the kitchen. So he likes to put his shoulder *just over* onto the tile. It went well, and I think the kids will have a good time. I made a round one because I'm a student - only accomplished scribes wrote on the rectangular tablets. Learners used a round shape to practice on. I gave up on the toothpick after about five seconds and used an assortment of items from my kitchen drawers. So....what do you think my tablet is "saying"? Here is my self-hardening clay recipe if you would like to try this at home. The recipe will make enough clay for six small tablets. Mix flour, alum and salt together in a bowl. Add water gradually to form a ball. Knead (pound, roll & pull) the clay, adding water until it no longer falls apart. Store in a sealed plastic bag in the refrigerator. Allow the clay to come to room temp for easy use. Let your finished project dry at room temp for 2 days. It will become very hard and can be painted. Japan: Where Lunch Equals Love. School lunches. I can't think of them without getting a little bit sad. My mother had a busy career and - quite wisely - put us in charge of making our own lunches to take to school. My mom didn't allow us to buy chips or the coveted Twinkies that our classmates enjoyed. In fact, all I remember having to put in the bag was a PB & J and a red apple. A bad combination in a metal Scooby-Doo lunch box. By noon, my sandwich was damp and flat and smelled of old fruit. Naturally, I was always trying to bargain a trade out of my classmates but I didn't have much of interest to swap. My friend Tammy's mom worked at a supermarket, so Tammy had a free and endless supply of Ho Ho's, Little Debbie Cakes and Fritos. I sat with Tammy every day. My mom would buy junk food for special occasions. I was the kid on the school field trip with the flat, damp, fruity smelling sandwich and the frozen can of pop, bowed out at the bottom and still undrinkable by noon. Elizabeth Street Elementary sold milk from a cart. In the third grade, I was chosen for the coveted milk cart position. I left math class ten minutes early to go down to the gymnasium and set up shop. Milk from the cart was 3 cents. Wednesdays offered a chocolate milk special, for 5 cents. By then, I was buying "hot lunch." It was 50 cents and we waited in long lines, looking at our money to see if we had any 1976 "Bicentennial" quarters. It was institutional food, and you quickly learned which meals, or parts of meals, were edible and which were not. In Japan, mothers prepare a boxed lunch for their children known as o-bento. O-bento aren’t just lunches, they’re like a lunch, a love note, and art all at the same time. Young women get up early and spend hours packing bento boxes with carefully prepared food to impress a boy they like. The quality of a child’s bento results in the passage of judgment on the mother, and either praise or embarrassment from the child’s peers. I often went to school without lunch money, and had to borrow from the principal's office so I could eat. At the end of the year, I owed a crazy amount of money - perhaps 7 dollars? - and had no way to repay it. I was afraid that if I asked my parents I would be punished. And my parents probably didn't know that I spent most of fourth grade lunch hour in the boiler room catching up on my math homework. It was supposed to be punishment for not having work done, but I honestly liked it in there. It was a warm, small space and gave me the peace and quiet I needed to go home and deal with what was happening there. At the end of the school year I gave the lunch lady my silver dollar collection to pay off the lunch money debt. I remember her asking me if I was sure - but she took them anyway. And probably swapped out her own money for the valuable coins. I told my mother this story a couple of years ago - just in passing when we were talking about something else. Big mistake. She cries every time she things of it. And no doubt, this blog post will upset someone who would rather I didn't remember it quite this way.